Torrential rains resulting in landslides and flash floods disrupted the lives of lakhs of people across the north-eastern states of Assam, Manipur and Tripura. In response to it, the following centres conducted primary flood relief services. 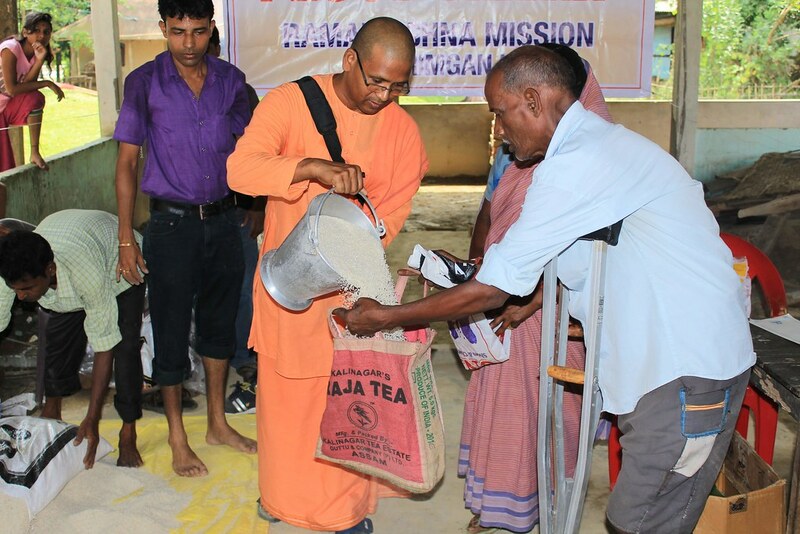 Tripura: In response to the flooding of various parts of the Unakoti district in June, Kailashahar centre distributed 800 kg rice, 37 kg dal, 2550 kg chira (flattened rice), 175 kg salt, 330 kg sugar, 214 kg milk powder, 848 packets of biscuits, 1330 sets of utensils (each set containing a cooking pot with cover, a ladle, a bucket and a mug), 3000 saris, 2000 dhotis, 1727 notebooks, 576 bars of soap, 2414 litres of water and 320 packets of candles among 2986 flood-affected families from 14 June to 13 July. Assam: (a) In the wake of flooding and submerging of various parts of Karimganj district, Karimganj centre distributed 2050 kg rice, 420 kg dal, 1000 kg potatoes, 84 litres of edible oil, 425 kg salt, 84 kg milk powder, 840 packets of biscuits, 2430 packets of ORS and 1268 halogen tablets among 405 flood-affected families from 17 to 22 June. (b) With the flooding of many areas in Cachar district, Silchar centre conducted a medical camp and provided medical care and free medicines to 722 patients in government shelter homes on 19 and 20 June. Manipur: Following the flooding of the rivers and breaching of riverbanks in Imphal district, Imphal centre distributed 10,950 kg rice, 2000 kg dal, 1082 litres of edible oil, 1100 kg salt and 1100 packets of dry fish among 1070 flood-affected families in Wangoi area of Imphal West district on 25 and 26 June.